Are you looking for a study guide on Lung Expansion Therapy? If so, then you have definitely come to the right place. 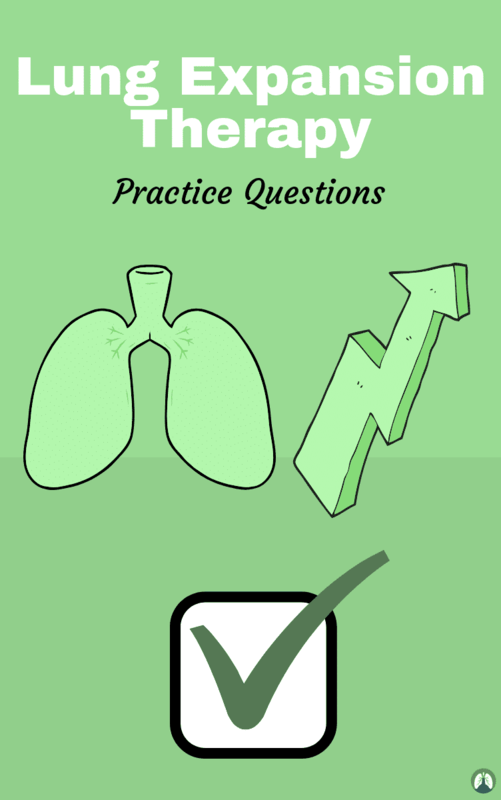 The practice questions found here cover everything you need to know for Egan’s Chapter 42 in order to ace your exams in Respiratory Therapy school. I’m ready to get started. Are you ready to get started? Then let’s go ahead and dive right in! Oh, and before I forget. If your Respiratory Therapy school is like mine, then you probably use the Egan’s Workbook as well. Don’t get me wrong, it’s a solid workbook that can be helpful at times. But my biggest issue is the fact that it takes way too long to look up all the answers! Instead of being a helpful tool, it actually caused me more stress because of how much time it required. 1. What is lung expansion therapy used for? It is utilized to prevent or correct respiratory complications in the postoperative period. 2. What is gas absorption atelectasis? Gas absorption occurs when mucus plugs block ventilation to selected regions of lung or if there is a significant shift in V/Q, gas distal to obstruction is absorbed by passing blood. 3. What is compression atelectasis? It is caused by persistent breathing with small tidal volumes and/or certain types of restrictive chest wall disorders. 4. What factors can cause atelectasis? Obesity, neuromuscular disorders, heavy sedation, surgery near diaphragm, bed rest, poor cough, history of lung disease, restrictive chest wall abnormalities. 5. What does atelectasis cause? Decreased FRC, V/Q mismatch, arterial hypoxemia, decreased surfactant production, and an ineffective cough which leads to retained secretions and possible pneumonia. 6. What are the clinical signs of atelectasis? History of recent major surgery, tachypnea, fine late inspiratory crackles, bronchial or diminished breath sounds, tachycardia, and an increased density and signs of volume loss on chest radiograph. 7. How does lung expansion therapy work? It works by increasing the transpulmonary pressure gradient (which is the difference between alveolar and pleural pressure) the greater the transpulmonary pressure gradient the more alveolar expansion will occur. 8. How can you increase the transpulmonary pressure gradient? It can be increased by decreasing the surrounding pleural pressure or increasing the alveolar pressure. 9. What therapy decreases pleural pressure? 10. What therapy increases alveolar pressure? IPPB and positive pressure therapies. 11. What is another name for incentive spirometry? 12. How does incentive spirometry work? It mimics natural sighing by encouraging patients to take slow deep breaths, they provide visual cues to patient when desired inspiratory volume of flow is reached. 13. What are the indications for incentive spirometry? Presence of pulmonary atelectasis, presence of conditions that could cause atelectasis like upper abdominal surgery, thoracic surgery, surgery in patients with COPD, presence of restrictive lung defect associated with quadriplegia or dysfunctional diaphragm. 14. What are the contraindications for incentive spirometry therapy? Unconscious patients or those unable to cooperate, inability to comprehend instructions, patients unable to generate adequate inspiration less than 10 ml/kg. 15. What are the hazards and complications of incentive spirometry therapy? Hyperventilation, discomfort, fatigue or overexertion, pulmonary barotraumas, hypoxemia (if oxygen therapy was interrupted). 16. How do you teach incentive spirometry therapy? Demonstrate then observe the patient tell the patient to sustain inspiratory effort for 5 to 10 seconds. 17. When is it best to teach incentive spirometry therapy? Preoperative patients prior to surgery. 18. What must be done before and after each incentive spirometry treatment? 19. What are the outcomes of incentive spirometry therapy? Absence or improvement of atelectasis signs, decreased respiratory rate, normal pulse rate, resolution of abnormal breath sounds, normal or improved chest radiograph, improved PaO2 and decreased PaCO2, increased SpO2, increased VC and peak expiratory flow, restoration of preoperative FRC or VC, improved inspiratory muscle performance and cough, attainment of preoperative flow and volume levels, and increased FVC. 20. What instructions are given for incentive spirometry therapy? Exhale normally, slow deep inspirations, inspiratory pause/breath hold, exhalation is slow and passive, rest between breaths, each treatment should have 10 efforts, most IS orders are ordered q1hr while awake. 21. What has to be documented during incentive spirometry? Date and time given, type of treatment, goals reached and number of times, breath sounds before and after, cough and nature of secretions, adverse reactions. 22. What is intermittent positive pressure breathing? It uses positive airway pressure, it is noninvasive ventilation, does not provide full ventilation but provides machine assisted deep breaths and stimulates coughing, treatments last 15-20 minutes exhalation is passive. 23. How does IPPB work? Positive pressure is applied to airway transmitted to alveoli and pleural space during inspiratory phase, alveolar pressures rise pleural pressures increase (less negative), gas flows in lungs because of pressure differences, exhalation is passive. 24. What are the indications for IPPB therapy? Patient with atelectasis isn’t responsive to other therapies, patient at high risk for atelectasis who can’t perform incentive spirometry. 25. What are the contraindications for IPPB? Tension pneumothorax, ICP greater than 15 mmHg, hemodynamic instability, active hemoptysis, tracheoesophageal fistula, recent esophageal surgery, active untreated tuberculosis, radiographic evidence of blebs, recent facial oral or skull surgery, singulitus (hiccups), air swallowing, and nausea. 26. What are the hazards and complications of IPPB? Increased airway resistance, pulmonary barotrauma, nosocomial infection, respiratory alkalosis, hyperoxia with O2 as gas source, impaired venous return, gastric distension, air trapping auto-PEEP overdistention, psychological dependence. 27. What is the baseline assessment of IPPB? Medical history, vital signs, sensorium and appearance, and breathing pattern and chest auscultation. 28. What are the outcomes of IPPB? Improved VC, increased FEV peak flow, enhanced cough and secretion clearance, improved chest radiograph, improved breath sounds, improved oxygenation, favorable patient subjective response. 29. What is the administration of IPPB? The respiratory therapist has to explain why the treatment is ordered what the treatment does how it feels and expected results, patient needs to be sitting up or semi fowler, may need nose clip, have to adjust pressure and flow treatment lasts 15-20 minutes. 30. What has to be documented with IPPB? Pre-assessment, post-assessment, adverse effects, medication used, settings used, volume achieved, length of treatment. 31. What is the triple S rule for IPPB? If patient has severe adverse reaction stop treatment, stay with patient, and stabilize patient. 32. What does PEP, EPAP, and CPAP stand for? Positive expiratory pressure, expiratory positive airway pressure, and continuous positive airway pressure. 33. What is CPAP therapy? Patients breathe through pressurized circuit against a threshold resistor at pressures between 5 and 20 CPAP maintains positive pressure during inspiration and expiration where as IPPB only maintains pressure on inspiration. 34. What are the indications for CPAP? Recruit collapsed alveoli, decrease patient work of breathing, improve distribution of ventilation, enhance secretion removal, treatment of cardiogenic pulmonary edema reduces venous return to right heart and consequently reduces filling volume of left heart. 35. What are the contraindications for CPAP? Hemodynamic instability and patients with hypoventilation. 36. What are the hazards and complications for CPAP? Barotrauma, hypoventilation, gastric distention, vomiting, and aspiration. 37. What is the most common problem with CPAP therapies? 38. What should be monitored during CPAP? Monitor for hypoventilation and elevated PCO2 inspiratory flow must be adequate. 39. How do you choose an approach for CPAP? Choose the one that is safest, simplest, and most effective, evaluate level of cooperation, amount of pulmonary secretions, and spontaneous vital capacity. 40. What type of patients are at risk for postoperative atelectasis? Patients with a history of lung disease that causes increased mucus production, chronic bronchitis and cigarette smoking with complications during surgery also patients with a history of inadequate nutritional intake. 41. What is the cause of postoperative atelectasis? Ineffective cough in postoperative patients because it increases chances of retained secretions. 42. What type of lung expansion therapy is physiologically most common? 43. What is monitored during incentive spirometry? Patient performance, frequency of sessions, number of breaths per session, inspiratory volume or flow goals and 3-5 second breath hold, effort and motivation, compliance with technique, device within reach and encouragement for patient to do it independently, new and increasing inspiratory volumes each day, and vital signs. 44. What are the symptoms of hyperventilation during incentive spirometry? Lightheadedness and dizziness are possible. 45. What are two devices used during incentive spirometry? Volumetric Incentive spirometry and Flow-oriented Incentive spirometry. 46. How does volumetric incentive spirometry work? Volumetric incentive spirometry devices measure and visually indicate the volume achieved during SMI they employ a bellow that rises according to the inhaled volume when patient reaches target inspiratory volume a controlled leak in the device allows patient to sustain inspiratory effort for short period like 5-10 seconds. 47. How does flow oriented incentive spirometry work? Flow oriented devices measure and visually indicate degree of inspiratory flow this flow can be equated with volume by assessing duration of inspiration or time. 48. What do both devices do? They attempt to encourage the same goal for patient a sustained max inspiratory effort to prevent or correct atelectasis one is not better than the other. 49. What patients benefit from IPPB? Short term use for patients who are at high risk for atelectasis and are unable to participate in more patient directed techniques such as incentive spirometry or deep breathing. 50. What should be included in the preliminary planning? The desired therapeutic outcomes are established the outcomes are based on diagnostic information that supports the need for IPPB therapy outcomes should be explicit, measurable and consistent with indications. 51. What is the purpose of a cough? Secretion clearance or airway clearance. 52. Which of the following is not a potential hazard of intermittent positive-pressure breathing? 53. Which of the following statements is not true about intermittent positive-pressure breathing (IPPB)? IPPB should be the single treatment modality for resorption atelectasis. 56. Which of the following initial flow settings would you select when setting up a continuous positive airway pressure flow-mask system for a patient with atelectasis? 2 to 3 times the patient’s minute ventilation. 57. In order to eliminate leaks in an alert patient receiving intermittent positive-pressure breathing therapy, which of the following adjuncts would you first try? 58. Which of the following patient groups should be considered for lung expansion therapy using intermittent positive-pressure breathing (IPPB)? Patients with clinically diagnosed atelectasis who are not responsive to other therapies, and Patients at high risk for atelectasis who cannot cooperate with other methods. 59. Which of the following positions is ideal for intermittent positive-pressure breathing therapy? 60. Which of the following are appropriate initial settings for intermittent positive-pressure breathing given to a new patient? Sensitivity 1 to 2 cm H2O below ambient pressure (i.e. -1 to -2 cmHO); pressure 10 to 15 cm H2O; moderate flow. 61. When checking a patient’s intermittent positive-pressure breathing (IPPB) breathing circuit before use, you notice that the device will not cycle off, even when you occlude the mouthpiece. What would be the most appropriate action in this case? Check the circuit for leaks. 62. What is the minimum airway pressure at which the esophagus opens, allowing gas to pass directly into the stomach? 63. Which of the following will make an intermittent positive-pressure breathing (IPPB) device cycle off prematurely? Airflow obstructed, Kinked tubing, Occluded mouthpiece, and Active resistance to inhalation. 64. Which of the following is an absolute contraindication for using intermittent positive-pressure breathing? 65. During administration of a continuous positive airway pressure flow mask to a patient with atelectasis, you find it difficult to maintain the prescribed airway pressure. Which of the following is the most common explanation? 66. Which of the following is NOT a potential contraindication for intermittent positive-pressure breathing? 67. Which of the following are potential desirable outcomes of intermittent positive-pressure breathing (IPPB) therapy? Improved oxygenation, Increased cough and secretion clearance, Improved breath sounds, and Reduced dyspnea. 68. The general assessment, common to all patients for whom intermittent positive-pressure breathing (IPPB) is ordered, should include which of the following? Measurement of vital signs, Appearance and sensorium, and Chest auscultation. 69. What is the most common complication associated with intermittent positive-pressure breathing (IPPB)? 70. Which of the following should be charted in the patient’s medical record after completion of an intermittent positive-pressure breathing treatment? Results of pre- and posttreatment assessment, Any side effects, and Succinct but complete account of the treatment session. 71. Which of the following are contraindications for continuous positive airway pressure (CPAP) therapy? Hemodynamic instability, Hypoventilation, and Facial trauma. 72. Which of the following are appropriate volume goals for intermittent positive-pressure breathing (IPPB) therapy? 10 to 15 ml/kg ideal body weight, and At least 30% of the inspiratory capacity (IC). 73. Prior to starting intermittent positive-pressure breathing (IPPB) on a new patient, what should the practitioner explain? Why the physician ordered the treatment, What the IPPB treatment will do, How the IPPB treatment will feel, and What the expected results are. 74. Which of the following are potential complications of continuous positive airway pressure (CPAP) therapy? Barotrauma, Gastric distention, and Hypercapnia. 75. Which of the following is false about gastric distention with intermittent positive-pressure breathing (IPPB)? Gastric distention is a relatively harmless effect of IPPB. 76. Which of the following mechanisms probably contribute to the beneficial effects of continuous positive airway pressure (CPAP) in treating atelectasis? Recruitment of collapsed alveoli, Decreased work of breathing, Improved distribution of ventilation, and Increased efficiency of secretion removal. 77. What is the optimal breathing pattern for intermittent positive-pressure breathing (IPPB) treatment of atelectasis? Slow, deep breaths held at end-inspiration. 78. A patient receiving +12 cm H2O flow-mask continuous positive airway pressure, you note that the pressure drops to +6 cm H2O during inspiration, but returns to +12 cm H2O during exhalation. Which of the following would likely correct this problem? 79. Which of the following are essential components of a continuous positive airway pressure (CPAP) flow system? Blended source of pressurized gas, Breathing circuit with reservoir bag, Low-pressure or disconnect alarm, and Expiratory threshold resistor. 80. Intermittent positive-pressure breathing is associated with what? 81. In administering intermittent positive-pressure breathing therapy, which of the following breathing patterns would be most desirable? 6 to 8 breaths/min, inspiration/expiration ratio (I:E) of 1:3. 82. The “Administration” of intermittent positive-pressure breathing (IPPB) should include which of the following? Evaluating alternative approaches to the patient’s problem, Setting specific, individual clinical goals or objectives, and Conducting a baseline assessment of the patient. 83. In terms of machine performance, what large negative pressure swings early in inspiration indicate? 84. When adjusting the sensitivity control on an intermittent positive-pressure breathing device, which of the following parameters are you changing? Effort required to cycle the device “on” (begin inspiration). 85. Lung expansion therapy is designed to treat and prevent what? 86. What are the two types of atelectasis? 87. What is Passive atelectasis? It is the result of shallow breathing and is caused by persistent use of small tidal volumes. 88. Passive atelectasis can occur with what? Surgery medications (CNS depressants) Neurological disorders, neuromuscular weakness, bed rest, and immobility. 89. Resorption atelectasis is the result of what? It results from an airway obstruction. Mucus plugs are present in the airway and block ventilation. Capillaries/blood flow absorb the gas. 90. What is lobar atelectasis? An entire lobe of the lung has atelectasis. 91. What are the factors that cause atelectasis? Obesity, neuromuscular disease, sedation, surgery, spinal injury, bedridden immobility, and a decreased cough. 92. What are the clinical signs of atelectasis? Breath sounds: decreased/crackles; tachycardia, tachypnea, cyanosis; secondary to hypoxemia; Chest X-ray: increased opacity; Normal breathing physics. 93. Lung expansion therapy increases lung volumes by increasing what? 94. The greater the transpulmonary pressure gradient the more what? The more the lung expands. 95. How does Incentive Spirometry work? It increases the transpulmonary pressure gradient by lowering the pleural pressure. It is the most effective because it mimics the normal physiology of breathing. 96. How does IPPB work? It increases the transpulmonary pressure gradient by increasing the alveolar pressure. 97. How do you know which lung expansion therapy method to choose? It depends on the needed equipment, personnel, risk, and cost. 98. How does incentive spirometry mimic natural sighing? By encouraging a slow, deep breathing. 99. Is IPPB used for short term or long term? It is used for short term. 100. IPPB can be administered how frequently? It can be administered several times a day or as frequently as once every hour. 101. What does IPPB require? It requires a spontaneously breathing patient. 102. How can IPPB be given? With a mouthpiece or a mask because it requires a tight seal. IPPB is administered with a pneumatic machine. 103. What is the Bird Mark 7? It is the most common type of IPPB. It is pneumatically powered and requires a closed circuit with exhalation valve and nebulizer. The machine incorporates a venturi or air entrainment jet to enhance flow capabilities and decrease FiO2. 104. What are the IPPB controls? Pressure, Flow, Sensitivity, Air mix control and apnea timer. 105. Which of the following situations is a contraindication for incentive spirometry? A patient whose vital capacity is less than 10 ml/kg, A patient who cannot cooperate or follow instructions, and An unconscious patient. 106. Which of the following conditions is most likely to predispose a patient to atelectasis? 107. Ideally, when should high-risk surgical patients be oriented to incentive spirometry? Preoperatively, before undergoing the surgical procedure. 108. A patient complains of numbness around his lips during IS. What should the therapist recommend? Tell the patient to slow his/her breathing rate. Decreased or bronchial/tubular breath sounds, tachypnea, and tachycardia when hypoxemia is present. 110. In teaching a patient to perform the sustained maximal inspiration maneuver during incentive spirometry, what would you say? 111. A postoperative patient using incentive spirometry complains of dizziness and numbness around the mouth after therapy sessions. What is the most likely cause of these symptoms? 112. Which of the following is FALSE about flow-oriented incentive spirometry devices? They have proved less effective than volumetric systems. 113. Which of the outcomes would indicate improvement in a patient previously diagnosed with atelectasis who has been receiving incentive spirometry? Improved PaO2, Decreased respiratory rate, and Improved chest radiograph. 114. Persistent breathing at small tidal volumes can result in which of the following? 115. Correct instruction in the technique of incentive spirometry should include which of the following? Diaphragmatic breathing at slow to moderate flows. 116. Lung expansion therapy works because of an increase in what pressure gradient? 117. Which of the following are potential indications for incentive spirometry? A restrictive disorder such as quadriplegia, Abdominal surgery in a COPD patient, and Presence of pulmonary atelectasis. 118. The respiratory therapist should instruct the patient to perform IS how often? 119. Lung expansion methods that increase the transpulmonary pressure gradients by increasing alveolar pressure include which of the following? Positive end-expiratory pressure therapy, Intermittent positive-pressure breathing (IPPB), and Expiratory positive airway pressure (EPAP). 120. In observing a postoperative woman conduct incentive spirometry, you note repetitive performance of the sustained maximal inspiration maneuver at a rate of about 10 to 12/min. Which of the following would you recommend to her? Take a 30-second rest period between breaths. 121. Which of the following patient categories are at high risk for developing atelectasis? Those who are heavily sedated, Those with upper abdominal or thoracic pain following surgery, and Those with neuromuscular disorders. 122. Which of the following is not a potential hazard or complication of incentive spirometry? 123. How do all modes of lung expansion therapy aid lung expansion? By increasing the transpulmonary pressure gradient. 124. What should the monitoring of patients using incentive spirometry include? Number of breaths per session, Volume and flow goals achieved, Maintenance of breath-hold, and Patient effort and motivation. 125. Which of the following modes of lung expansion therapy is physiologically most normal? 126. Acute respiratory alkalosis is a very common problem and occurs when? When the patient performs IS too rapidly. 127. An alert and cooperative 28-year-old woman with no prior history of lung disease underwent cesarean section 16 hours earlier. Her x-ray film currently is clear. Which of the following approaches to preventing atelectasis would you recommend? 128. Successful application of incentive spirometry depends on what? The effectiveness of patient teaching. 129. How can the transpulmonary pressure gradient be increased? Increasing alveolar pressure and Decreasing pleural pressure. 130. Incentive spirometry devices can generally be categorized as which of the following? 131. Which of the following is not at high risk for developing postoperative atelectasis? Those with a non-smoking history. 132. A patient who has been ordered to have expiratory flow rates measured probably has what? 133. What is the pressure do we use with the IPPB? 134. What is the maneuver that requires a deep inspiration, closing the glottis, having the diaphragm and other muscles of respiration contracting and high intrapulmonary pressure being achieved? 135. What are the 4 IPPB interfaces? Mask, flange, trach adapter, and mouthpiece. 136. IPPB stands for what? 137. To increase the tidal volume on an IPPB, you would increase what? 138. If the patient can’t trigger an IPPB breath and the manometer needle is not moving off of the zero mark, you would suspect? The patient is breathing through their nose. 139. What do we call the commonly used device for lung expansion which requires negative transpulmonary pressure? 140. What are the goals of IPPB? Deeper breath, promote cough, improve distribution of ventilation, and better ABG results. 141. What is an alternative therapy to IPPB? EzPAP, incentive spirometry, or pursed lip breathing. 142. When you decrease the flow, it does what to inspiratory time? 143. What is the ideal I:E ratio when delivering IPPB? You want more expiratory time. 144. What is the purpose of EzPAP? It helps with the prevention and treatment of atelectasis and for lung expansion therapy and is recommended for patients with a decreased FRC. 145. What are some adverse reactions that occur with EzPAP? Increased WOB that may lead to hypoventilation, increased intracranial pressure, cardiovascular compromise, decreased venous return, air swallowing, and pulmonary barotrauma. 146. What are the therapeutic outcomes of EzPAP? And that wraps up our study guide on Lung Expansion Therapy. I hope that these practice questions were helpful for you. I’m confident that if you go through them a few times, you can easily learn everything you need to know about Egan’s Chapter 42. But as I always say, it never hurts to go back and read the entire chapter and that’s something I always recommend. Thanks again for reading and as always, breathe easy my friend.